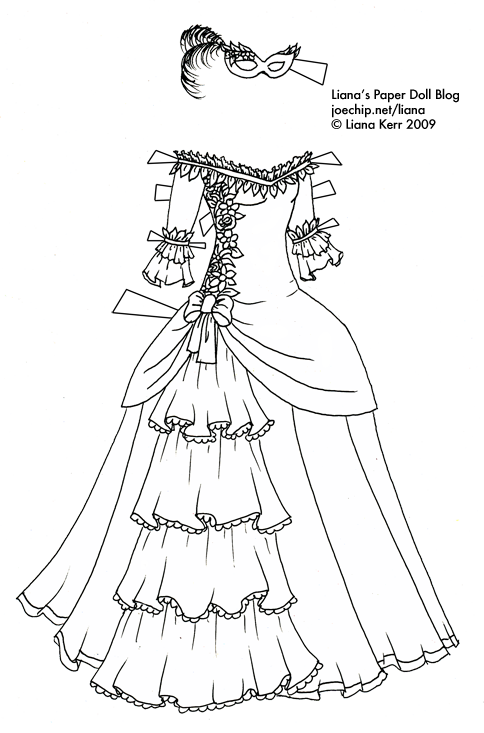 Click for larger version (black and white masquerade gown) (PNG), click for larger version (brown and red elf dress) (PNG); click for PDF version (black and white masquerade gown), click for PDF version (brown and red elf dress).Click here for the list of dolls. I learned my technique for coloring gold (fabric, metal) a while back, when I tried copying a costume from a specific singer or musical group. Which singer / musical group was it? Not giving you any more clues than that… One guess per person please! The masquerade dress is lovely! I really like that ruffle on the side. If I had more time I would try to sew something like this. That is such a beautiful dress! I found you about a week ago, and I am purely amazed! I am glad that I have found you when you are making masquerade gowns because I am doing a Phantom of the Opera based outfit, and I really need inspiration! I love both of these dresses!!! Here is a picture of the masquerade dress that I colored! HI, I love the black and white masquerade gown and would like to make this dress only for me to wear, not to sell. I hope that is okay, and I would love to send a picture of it after it is finished… i just have to figure out how :) Hope its all right!